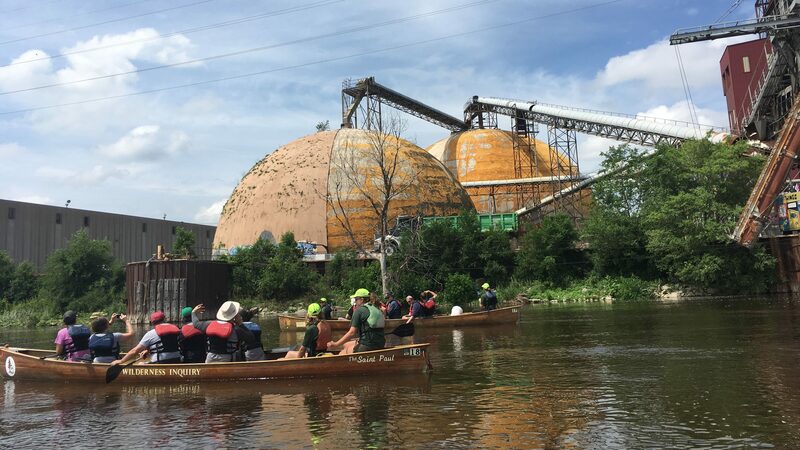 From September 1 to the end of November, an Anthropocene River Journey down and along the Mississippi gathers the explorations of the five field stations and connects them through an educational canoeing expedition. Travelling participants will document, report, and publish their findings and experiences on the project website. Sediment, Settlement, Sentiment: The Machinic River (Field Station 1) addresses the area along the Mississippi between Minnesota, Wisconsin and Iowa, an engineered river. The River Journey will begin here in September with an excursion to the mythical source of the Mississippi, Lake Itasca, and an outdoor arts festival in Minneapolis, presenting film screenings and presentations at the locks and dams along the bank. Anthropocene Drift (Field Station 2) centers on the infrastructure of the monocrop industry and the process of biome change in the Midwestern United States. A mobile symposium brings together agroecologists, Native leaders, local residents and international scholars for a series of events, tours, and small group discussions to better understand the origins of the current engineered landscape and to build alliances for more just and sustainable alternatives. Anthropocene Vernacular. Industry, Indigeneity, and Empire (Field Station 3) explores the long and conflicted histories of settlement in the St. Louis area. At sites like Sauget, known as Monsanto town, artists and scientist will publicly unfold the landscape of “The American Bottom” in conversation with the communities and broader public through exhibitions, panel discussions and publications. Mississippi Confluences (Field Station 4) engages with the ecologic-economic-technological infrastructures in the “Confluence Area” between Kentucky and Illinois. Within this framework, members of the collective Deep Time Chicago will create non-conventional maps, experimental videos, multimedia installations, and participatory, public events as a way to collaboratively understand the ecologic-economic-technological infrastructures that connect our lives and livelihoods together in this contested political (and geological) moment. An exhibition at the museum of the Southern Illinois University will display the works, joined by screenings and performances in Cairo and Paducah during its opening days. And finally, Commodity Exploitation (Field Station 5) explores identity and commerce in the Delta region, with a particular geographic focus on the differences between urban and rural communities, and how Jackson, MI and Natchez, MI are representative of the collision between identity, commerce and the entrenched legacy of chattel slavery. Public audio walks, panels, artistic performances and a podcast series will discuss the history of the “Plantationocene” on site. The findings of the entire project will be carried downstream to the Anthropocene River Campus: The Human Delta (November 10-16, 2019, hosted by the New Orleans Center for the Gulf South at Tulane University). The campus will tie together common themes from the project – the flow of commodities, clashing temporalities, claims to property and access, risk and equity, engineering and management, and even the stark reality of spiritual and material exhaustion – as they express themselves in local sites around the Delta. Discussions will focus on the environmental vulnerability of the region, made evident during the events following Hurricane Katrina; local partners will participate in discussions on related solutions and their urgency. A weeklong series of experimental seminars will be joined by public presentations, discussions, and a closing ‘Forestival’ at A Studio in the Woods at Tulane University, as well as a public forum of the geo-scientific Anthropocene Working Group. Further information about each of these projects can be found here, at Wunderbar Together, as the year goes on, and also on the Anthropocene website. You can also find out more about HKW and their programming this year on their homepage. Wunderbar Together Takes a Trip to the Moon! Wunderbar Together is already bringing over 1,500 events to cities in all 50 states, and now it can add one more location to the list – the moon! Students at the Pittsburgh Ballet Theatre School staged a performance at the Mattress Factory in Pittsburgh, Pennsylvania with German Artist-in-Residence Karina Smigla-Bobinski. This one-week educational event is oriented towards researchers at various levels of academia and from diverse backgrounds in the sciences, humanities, engineering, design, and the arts. Artists, actors, and activists from civil society, the arts, and politics are also strongly encouraged to apply.